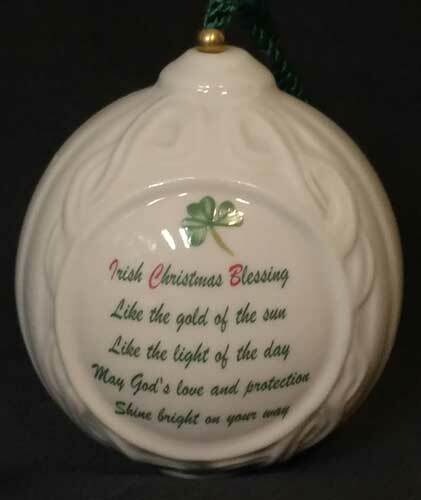 The Belleek ball ornament features a double sided design that is enhanced with an Irish blessing and a hand-painted green shamrock along with an embossed image of the Holy Family on the reverse side. The Belleek blessing ornament is further enhanced with embossed Celtic knot-work. 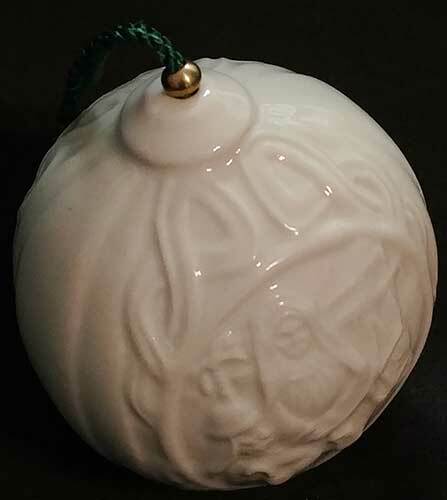 This Belleek China ornament measures 2 1/4" deep x 2 1/4" wide x 3 1/4" tall; it is ready to hang with the included green cord. The Belleek ornament is crafted of fine china. This Irish Christmas ornament is handmade and hand-painted in Belleek, Ireland and it is gift boxed with Celtic knot and shamrock history cards, complements of The Irish Gift House.